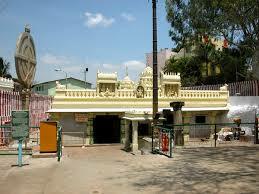 Here is Some Information about Shri Gavi Gangadhareshwara Temple in Bangalore karnataka India. 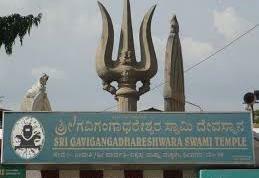 The Shri Gavi Gangadhareshwara Temple is located at Hulimavu, Bannerghatta Road in Bangalore, Karnataka.The temple was built around 9th century.The temple is Lord Shiva and here known as Shri Gavi Gangadhareshwara.Shri Gavi GangadhareshwaraOne of Bangalores and Indias oldest and very famous cave temples.There are other idols inside including the idol of Agnimurthi, which has two heads, seven hands and three legs. Those worshiping this deity believe it will cure one of all eye defects. The temple is also noted for its four monolithic pillars, which represent Damaru, Trishul and two fans in the courtyard. 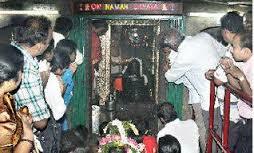 The deity in the main shrine is a Shivalinga. Apart from this, there is also Nandi sculpture in the front of the temple and a rare idol of Agni, the God of fire. Gavi Gangadhareshwara Temple is popular because of somewhat mysterious stone discs in forecourt in addition to the accurate planning permitting for Sun to shine on temple in certain time of the year. The temple shrine is a protected monument under the Karnataka Ancient and Historical Monuments, and Archaeological Sites and Remains Act 1961. Every year on the 14th of January, a rare and significant phenomenon takes place inside the inner sanctum of the temple. The rays of the setting sun on the western horizon, shoot a beam of light, that passes from under an arch, on the western wall of the temple, before moving towards the inner sanctum. It first lights the back of the statue of Nandi and passes over its horns and reaches the feet of the Shivalinga. Finally the beam of light illuminates the whole of Shivalinga. There are lots of beliefs and myths associated with the temple. It is believed that anyone who worships the idol of Agni (the God of fire) situated inside the temple, will be cured of all eye defects.Devotees also believe that there are two tunnels, that extend from the inner sanctum of the temple. One of them proceeds towards the city of Varanasi in the northern part of India. The other extends up to another temple of Shiva with the same name, the Gangadhareshwara temple, located on the hill of Shivagange, about 10 miles from this temple. The major attraction of the temple is the illumination of Shivalinga by the Sun.On Makara Sankranthi day, from January 13th to 16th of every year, Sun rays passes through two windows of the temple and through the horns of Nandi inside the temple and falls on Shivalinga. The history of the temple dates back to the 9th century. It is believed that the temple was cut out of a rock in the 9th century. 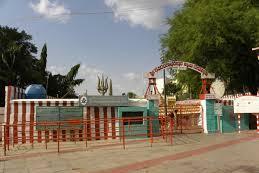 It was used by the great sage Gowthama to perform penance. 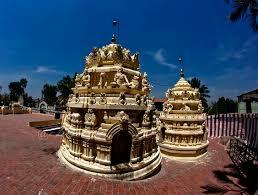 Later in the 16th century,Kempegowda I, the founder of Bangalore, revamped and extended the temple. According to local legend, Kempegowda was imprisoned by Rama Raya. He suffered imprisonment for five years. When he was released, he constructed this temple to show his gratitude.Artistic depiction of the temple is found in the painting of the British artist James Hunter in 1792. 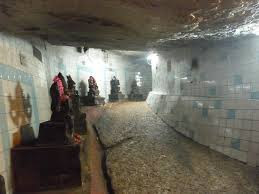 The architects of Sri Gavi Gangadhareshwara Temple deliberately planned it in such a way that on Makar Sankranti, the sun's rays always pass through Nandi's horns, while lighting up the Shiva Lingam.The inner sanctum of the temple is situated inside a cave carved out in the rock. 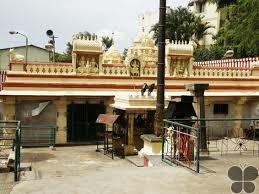 The main attraction of the temple is the granite pillars situated in the forecourt of the temple. Two of the pillars support huge discs that represent the sun and the moon. The other two pillars have a trident (trishul) and a two-headed drum (damru), representing the two significant possessions of Lord Shiva. By Road : There are many public and private vehecals available to reach Shri Gavi Gangadhareshwara Temple Bangalore.The people can reach Lalbag Garden of 2 km to Shri Gavi Gangadhareshwara Temple Bangalore.The NEarest Bus stand is Kempegowda Bus Stop. By Rail : The Nearest Railway station is Bangalore city Railway station. By Air : The Nearest Airport is Bangalore International Airport.